How To Profit From Market Meltdowns? Fear and greed are the most dominant emotions driving trading and investing. Even seasoned investors sometimes have doubts about their decisions. Were they correct in their analysis? Especially during weeks like this, with Monday's 10% waterfall in gold (NYSEARCA:GLD), followed by a 2% drop in equities (NYSEARCA:SPY) and a 40% one-day spike in volatility [an imprecise proxy for volatility is (NYSEARCA:VXX)], it is important to remind yourself about the principles that guide your investment decisions. Does this 2% market drop really change the fundamental opinion that you have about the stocks that you hold? Or is it just an irrelevant noise? Is it just a continual never-ending game of fear and greed that savvy traders play on the less able to knock them out of positions? To force them to make a trade? Basic animal instincts are sometimes very useful for investors to remember and be aware of. In nature, if you move, you draw attention. When the markets move sharply, it draws our attention and the attention of virtually every investor. Attention is good, but we should not trade on it. If something caught our attention, like that hot social media or 3D printing stock, it is usually the case that someone wanted us to pay attention. So once we make the move and catch the prey, buy that stock, we often fail to realize that we are usually late to the party and we might end up being the bait for a bigger, faster, smarter predator. In fact, by making a move, prey draws attention of predators in nature. Similar in investing, by trading, you draw attention of the beasts such as bid-ask spreads and trading fees, and savvy traders and scalpers. By trading you usually end up buying high and selling low. There are many rules successful long-term investors follow. I will just list the four that are especially important according to my opinion, to become a real long-term investor and don't end up being a bait. 2. Never use margin or leverage. Period. Just look at the 10% gold price drop in one day and imagine all the margin accounts that were completely wiped out. Game over. Now imagine those accounts, which were not only wiped out, but now owe multiples of their former net worth to the broker. With the price of gold down 10% I cannot help but remember my friend who received a really bad margin call 10 years ago. He was very young, fearless and greedy like most of his companions. And he didn't have proper knowledge and experience with trading or investing. His $20,000 account, which he funded with life-startup money from his grandparents, was not only wiped out. He ended up owing $40,000 more to the broker at the age of 22. This is a priceless lesson that most people had a chance to learn from someone else. But some unfortunately had to learn it the hard way. Take into consideration the worst possible scenario. When purchasing stocks, this would mean imagining that a company goes bankrupt. This is exactly how Warren Buffett and other smart long-term investors think before buying a company. What if it fails completely. That's why they always try to purchase stocks with a margin of safety, as close to the book value, or even below it. Also, Warren Buffett once said that you should only consider buying stocks that you would not mind ending up owning even if the stock market was shut down for 10 years and you couldn't sell them. The message is clear. Always be ready even for the most unimaginable bad thing to happen. Even the most dreadful, most negative event, has a positive side. It is just a matter of finding it and acting accordingly. As is the case with this sharp gold and equities sell-off. Investors can take advantage of virtually any situation, good or bad. There are no bad events - there are just good or bad reactions to it. If you want to be just a little bit greedy, I suggest you start buying your favorite stocks with a small portion of the budget that you allocated for the total purchase. 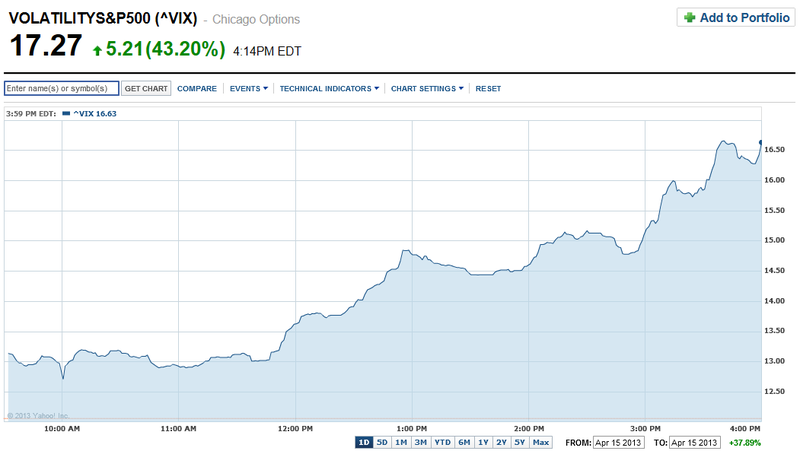 This SVXY trade is an opportunity at a quick 30% gain. However, it is very speculative and I am allocating just a small portion of my portfolio to this trade. 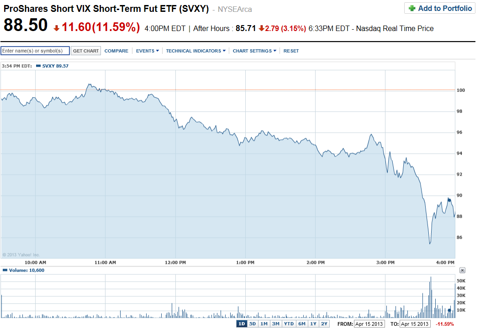 Moreover, I am accompanying my SVXY shares with covered call options. I don't perform this trade as a speculation in principle, but I use the inverse volatility trade as a long-term hedge by moving part of my cash to SVXY at times of extreme one- or two-day downward market movement. If you don't plan to use options, you can also enter this trade with another inverse volatility ETF (NASDAQ:XIV). 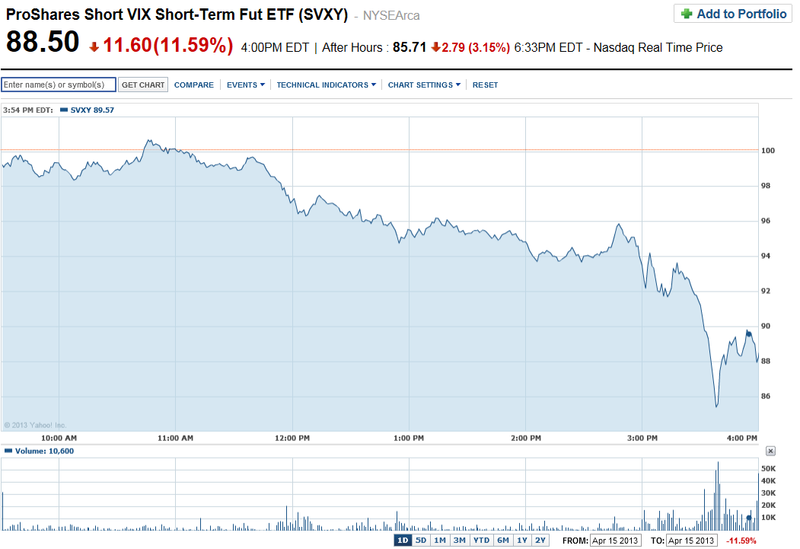 Another possibility is to short the VXX through stocks or options. You can even add the covered put option. And what are your golden rules of investing? How do you keep calm during sharp market sell-offs? Disclosure: I am long SVXY. I wrote this article myself, and it expresses my own opinions. I am not receiving compensation for it (other than from Seeking Alpha). I have no business relationship with any company whose stock is mentioned in this article.